I have, for you today, a guest blogger and writer, Aleya Bamdad. She asked if she could share a piece on health for our nails. I told her it was right up my alley and I thought you, my faithful readers, would enjoy. Giving yourself a weekly manicure, wearing gloves while doing dishes and applying moisturizer are all good ways to take care of your nails. However more important than any of these is the nutrients that you put into your body that make you strong and beautiful from the inside out. Here is a list of vitamins that you should incorporate into your diet to see results. Vitamin B Complex– When we refer to vitamin B complex we are referring to the entire range of vitamin Bs there are available on the market. This vitamin is very effective in helping you grow healthier, stronger and longer nails so that you will spend more time enjoy them and less time filing away at chipped areas. Taking a dose of B complex helps your body to fight infections so that you have a lesser chance of getting infected by a fungus and an easier time healing form one should you get it. You can get a good dose of vitamin B by eating lean meats, fish, peppers, spinach and kidney beans. Biotin– A form of vitamin B which is taken by a lot of people to prevent hair loss, Biotin is also a good friend to your nails. When taken regularly it makes your nails thicker so that they are less brittle and less likely to break. Biotin is found in foods such as nuts, carrots, eggs and berries. Calcium– One of the most important supplements that every woman should incorporate into her body after the age of twenty five. Calcium helps not only to strengthen your nails but to help maintain healthy bones as well. If you’re a coffee drinker, try to keep it down to two cups a day because coffee is known to eat away at the calcium in your body. 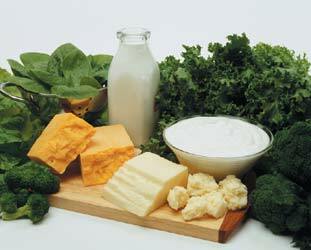 Calcium is found in cheese, milk and yogurt. Vitamin C– Commonly known as a supplement that fights colds, vitamin C isn’t given enough credit for its other attributes. Packed full of antioxidants, vitamin C builds collagen which you need to grow strong, healthy nails. You can find loads of vitamin C in oranges, strawberries, papayas, dark leafy greens and broccoli. Vitamin D– Not only is vitamin D good for your skin it’s also good for your nails because it helps you to absorb calcium. While you will get a little bit of it from the sun you should make sure to take vitamins as well because it’s not safe to get too much sun. Foods rich in vitamin D include fish, milk, orange juice and bran. Vitamin E– Just as popular as vitamin C, vitamin E is known to have many wonderful qualities that work to improve our beauty regiment. As far as nails go, it helps to make them stronger and grow longer faster. You can get a healthy dose of vitamin E by eating foods such as nuts, spinach, tomatoes and sweet potatoes. No matter how healthy of a diet you maintain you will never get enough of the vitamins that your body needs to stay healthy. To look and feel your best and have gorgeous nails it’s always important to remember to take your vitamins every day. Good luck and stay beautiful. Before the pizza gets here (and, Happy Thanksgiving, by the way), I want to show you a super deal I’m proud of finding. I do shop at Claire’s Boutique because they have some cute things and I have to stalk the nail polishes, as well. $32 down to $16? Pfft….try a final clearance of $5!!!! It’s not a big purse,but I love the teal and purple faux reptile skin. As I was reviewing these photos, I noticed I got a glimpse of the movie poster I have up in my bedroom ‘nook’ area. When I was in the video retail industry, one of the District Managers remembered that I said ‘Ever After’ was one of my very favorite movies. He got the poster for me. Pop A Bottle, Birthday Beyotch! Color Club’s ‘Beyond the Mistletoe‘ was so pretty, I wore it an extra day. So, I don’t have a dupe or comparison post today. The Starbucks guy asked me if I was ‘rockin’ the glitter’ this season. He told me that his girlfriend knows about the ‘foil method’ because she loves to wear glitter too. If they only knew how much glitter I really have! And just because I have a gazillion few new nail polishes, doesn’t keep me from buying looking at more. I think I would like the person who came up with this name. I don’t have Deborah Lippman’s ‘Happy Birthday’ but I have plenty like it. Once I round them all up, a comparison/dupe post is in order. Click here if you’d like to see a swatch of DL’s ‘Happy Birthday’ at Makeup and Beauty Blog. ‘Pop A Bottle’ might be more fitting for Mardi Gras. However, I’m fairly confident that I have at least one other bottle of polish to compare it. It is, without a doubt, a celebratory polish. It’s a Spumante/Sparkletini/Wine but, can I get a great, big YUM! I like to give this as a gift when I go to house parties. I like the Green Apple and the Peach flavors. I have some Peach in the refrigerator right now, ready whenever guests stop by. Yes, I realize it is cheap inexpensive, but I didn’t know it at the time Renae served it at the salon.